Mince chili and garlic. Slice scallions. Set greens aside for garnish. Slice bacon into wide strips, then fry it in a pan over medium heat until crispy. Add sesame oil, then add scallion whites, minced garlic, and chili to bacon and sauté for approx. 1 min. or until fragrant. Add rice and fry for approx. 2 min. Add soy sauce and toss to combine. When rice starts to become slightly crispy, crack egg into pan and quickly toss everything to scramble the egg. Add salt to taste. 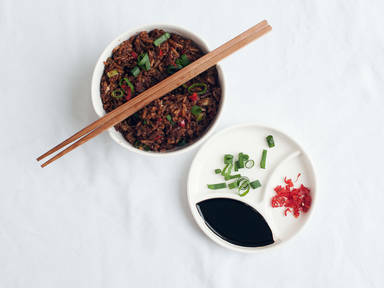 Transfer to a serving bowl and garnish with reserved scallion greens, fresh chili and soy sauce to taste. Enjoy!